Entries are now being taken for the 2014 Inglis Select Yearling Sales Series, which will again provide all breeders, big or small, with tailored market leading options for their young thoroughbreds. “Every horse is as important to us as it is to its breeder, therefore we take a lot into consideration when setting our sales dates that will suit vendors, buyers and ultimately the young growing thoroughbreds that are being offered for sale,” said Inglis’ Managing Director Mark Webster. “Inglis graduates continue to set the benchmark on and off the track, exampled by the outstanding feats of Black Caviar, All Too Hard, Exceed And Excel and Fastnet Rock this season. “All our innovations adopted in 2013 including splitting the Classic Sale into a Summer and Winter Book, the new ‘Blue Riband’ session at Premier, the VOBIS Gold Sale, Inglis TV Live and our iPad App have been met with great success and we look forward to raising our benchmarks into 2014 and beyond,” added Webster. Inglis’ experienced and trusted bloodstock team will be out in the field shortly to discuss with breeders the suitable sales options for all yearlings entered in Inglis’ Select Yearling Sales Series for 2014. The online entry system can be utilised HERE. Hard-copy entry forms can be downloaded via the links below. Easter continues to be the pinnacle of all thoroughbred sales in Australasia. The Australasian record price for a yearling at auction was eclipsed twice at the 2013 Easter Sale, which was attended by the most diverse buying bench ever assembled at a thoroughbred auction in the Southern Hemisphere. No less than 23 sires recorded their best result of the year at Easter including Redoute’s Choice, Fastnet Rock, Snitzel, High Chaparral, More Than Ready, Commands, Medaglia D’Oro, Shamardal, Charge Forward, Dane Shadow, Sebring and All American. Rising average and median prices in both Session 1 and Session 2 are a clear endorsement of the respect that the international community has for yearlings offered at Easter. Easter Yearlings go into the leading stables around the globe, giving them the best chance to reach their full potential, just as fellow graduates All Too Hard, Fastnet Rock, Exceed And Excel, Samantha Miss, Mosheen and company did. Melbourne Premier is the only major thoroughbred auction in the world to record an increase in average price seven out of the last eight years. Session 1 of the 2013 Sale finished with the average price jumping up almost 10% to $78,627. The inaugural 'Blue Riband' session recorded an average price of $116,564 at an 85% clearance rate. Coupled with an honour roll growing in quality and quantity, such as Black Caviar, Igugu, Starspangledbanner, Sacred Kingdom and Ortensia, the Melbourne Premier Sale is simply irresistible. Breeders are encouraged to be part of Premier’s progress. Shrewd local, interstate and overseas buyers target the Classic Sale, as it continually rewards those that back their judgement on the racetrack. 2013 Summer Book recorded 13% increase in average and 25% increase in median prices. Winter Book sold colts up to $100,000 and fillies to $80,000. Now with successful Summer and Winter options, breeders should target Classic, just as buyers do. In Australia's strongest racing state, the tremendous benefits available for Super VOBIS and VOBIS Gold horses are well recognised. Athletic, well-presented yearlings were in high demand at the inaugural Melbourne VOBIS Gold Yearling Sale. Put your yearling into the race for gold in Victoria. Local and interstate buyers love coming to the Hunter Valley in May for the Scone Cup Carnival year after year. With profits going to the Hunter Thoroughbred Breeders Association the Scone Yearling Sale is the local sale for local breeders. 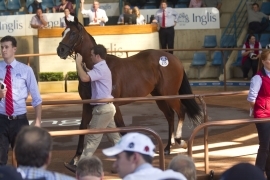 "Where and when breeders sell their yearlings is vital to commercial success. Inglis is very pleased to provide breeders with a range of honest market leading options to maximise the sale ring potential of every yearling accepted into the 2014 Inglis Select Yearling Sales Series," says Mark Webster. For more information visit www.inglis.com.au or speak to Inglis’ bloodstock team in Sydney on +61 2 9399 7999 or Melbourne +61 3 9333 1422.